In my previous post, I told you that I like to check into hotel rooms from time to time and draw all night while sipping coffee and listening to the “muzak” on The Weather Channel. 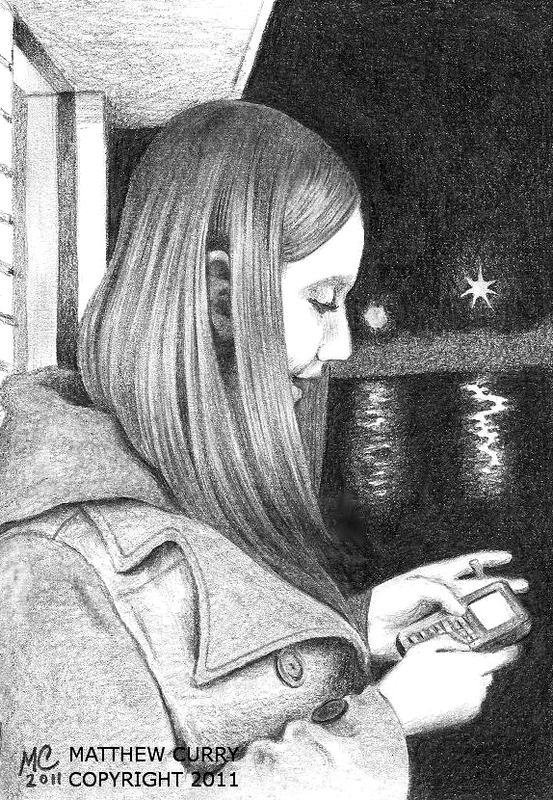 In that post, I mentioned a pencil drawing called “Stacey Texting in the Rain.” I decided I would share it with you here. In 2011, the day after Christmas, I took a photo of my friend Stacey standing in front of the gas station where she worked at the time. It was late at night and there were no customers, except me. She was standing under the awning, out of the rain, smoking a cigarette and texting. A few days later, I went “camping” at the Motel 6 and spent the whole night drawing, working from the photo. I tried to capture the wet parking lot in the background, with the streetlights reflected in it, but it turned out looking like an ocean instead. Oh well. I’m still proud of it. 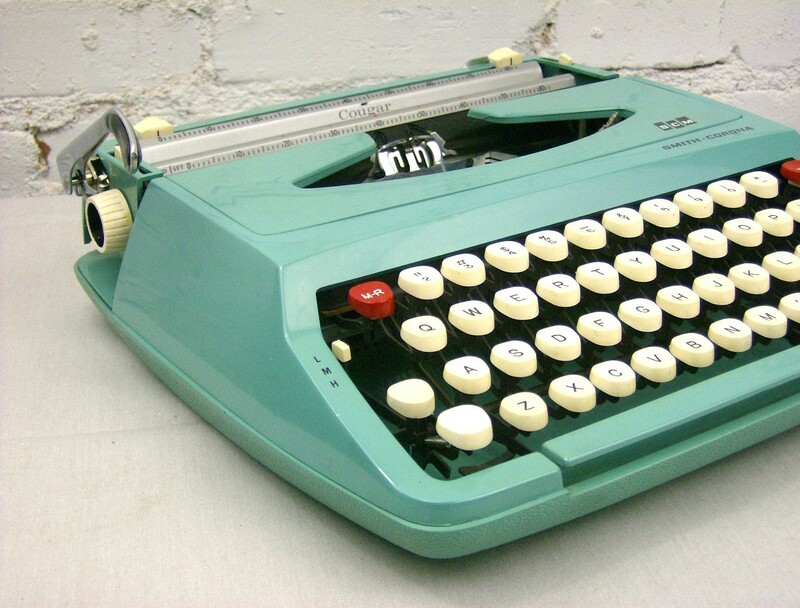 It was featured in the Georgia Highlands College literary magazine, The Old Red Kimono, in 2012. I feel like I do my best writing and drawing in hotel rooms. I wrote part of my science fiction novel last year (a chunk of the first chapter) during a camping trip at the Days Inn. I also drew a picture called “Stacey Texting in the Rain” while I was staying at the Motel 6 in late 2011. 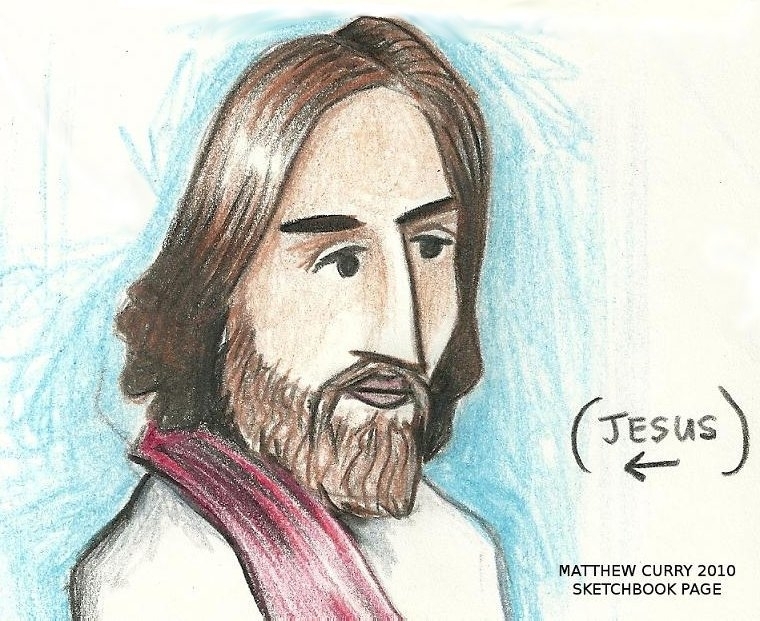 A few years ago, I drew this picture of Jesus in my sketchbook while I was spending the night at a hotel. I was feeling lighthearted and whimsical at the time, so I drew him in a cartoonish style. It isn’t intended to be disrespectful or sacrilegious. I love Jesus Christ with all my heart. Since I’m reflecting on his crucifixion and resurrection this weekend, I thought it was a good time to drag this picture out and post it. I recently learned how to embed a video in a blog rather than just a link. I think a window with a video playing inside it looks SO MUCH better than a string of letters, numbers, punctuation marks, and “equal” signs. I feel like I’ve moved up in the world now. Here’s one of my favorite White Stripes videos. This one is called “You Don’t Know What Love Is.” It’s on the “Icky Thump” CD from 2007. Jack White is one of my heroes. I still have a Marlboro pack he signed for me in Atlanta back in 2006. Here’s a drawing I’m working on. When I came home from church this afternoon, I put “Plan 9 From Outer Space” in the DVD player and a frozen pizza in the microwave. It was cool and windy outside, so I opened a window and watched the curtains dance. After I finished eating, I sat on the couch and started drawing this picture while “Plan 9” played in the background. It’s one of my favorite “drawing movies.” There’s no need to actually watch it anymore. I’ve seen it hundreds of times and I can quote the whole thing, pretty much. 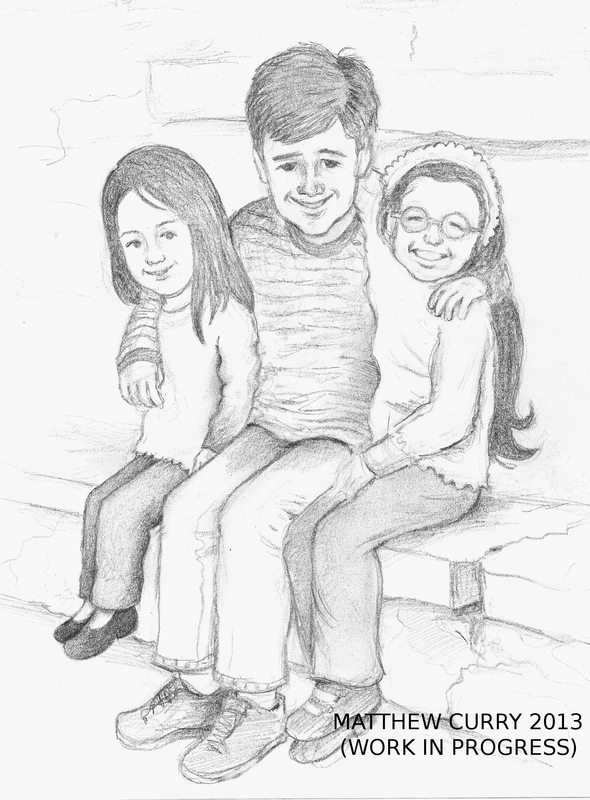 My friend Marisela asked me to draw her children the other day. Usually, I don’t draw portraits on a “for hire” basis — partly because I’m always up to my neck in my own art projects … and also because it turns me into a twitching, trembling, stressed-out basket case. If I see someone I want to draw, I’ll draw them and enjoy doing it. But if someone ASKS me to draw a picture for them, it’s not the same. When I was younger, people asked me to draw them all the time and then they griped at me afterward. In my mind, I still hear voices shouting, “You gave me a pig nose!” and “My eyes don’t look like that!” So I try to avoid the portrait business as much as possible. Too many bad memories associated with it. But I decided to take Marisela up on it. Just this once. I’m still going to fiddle with this picture and fine-tune it over the next few days. Here’s “Plan 9 From Outer Space.” Enjoy. 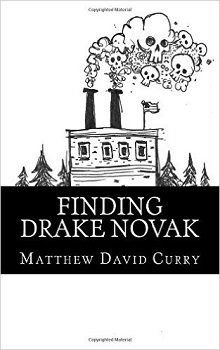 My science fiction novel will be available on Kindle very, very soon. I promise. My editor, Judy Brooks, has carefully combed through the whole manuscript. 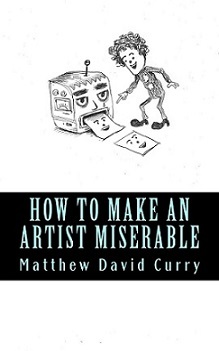 The illustrations are drawn, the jacket blurb is written, and my friend Emma Ball has designed the cover. (Thank you Emma!) As soon as the book is uploaded, I will post a couple of the illustrations on here, along with a link to Amazon. I hope you’ll find the story exciting, terrifying, and funny. I can’t think of anything interesting to say, so I’ll end it here. Have a good weekend. Lately, my co-worker has been jamming out to 90s music on Pandora. He works right beside me, just a few feet away, so I hear every song over the groaning and screeching of ancient machinery. Rhyan, the co-worker I’m referring to, is 21 years old. I’m 33, so I have a different relationship with the music. I have plenty of not-so-old memories of driving around in a ’76 Monte Carlo, listening to Nirvana, Third Eye Blind, Semi Sonic, Fastball, Ben Folds Five, and Eagle Eye Cherry. But Rhyan is probably too young to remember when all this stuff was fresh and brand-new. To him, the songs are just remnants of some bye-gone era in the distant past … the way I think of Woodstock music, for example. I already spend a lot of time reminiscing about the 90s anyway, with or without Rhyan’s high-tech music box. I’m not sure exactly when it happened, but some time in the middle of my 20s, I started thinking about the past more and more, savoring my memories of the 80s — memories of Alf, the California Raisins, Super Mario Brothers, and Ronald Reagan’s grandfather-like persona. Now the 90s are beginning to take on that same dreamy sparkle. 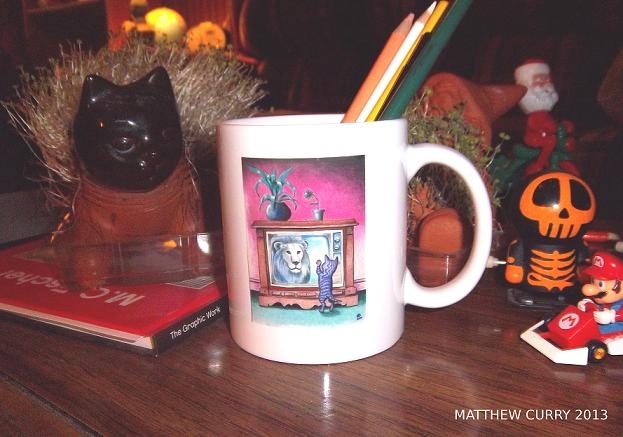 I’m selling my artwork on coffee mugs, teapots, posters, tote bags, iPad sleeves, and several other doodads. Please take a look at my store. I appreciate everyone who has already ordered items. Thank you very much! I’m going to share a clip from my favorite TV show with you. Before I do, I need to give you some background. “Doctor Who” is a British science fiction series that began in 1963 and ended in 1989. It was known for its low budget and cheesy special effects. I fell in love with the show when I was very young and watched re-runs of it every Saturday night on Georgia Public Television throughout my childhood. I’ve never outgrown it. In 2005, the program came back with a bigger budget and high-quality special effects. I’m not ashamed to tell people I’m a fan anymore. The program is about a mysterious old alien, known only as The Doctor, who travels through time and space in a ship that’s much bigger on the inside than it is on the outside. (It looks a little bit like a phone booth on the outside — but “Doctor Who” was around long before “Bill and Ted’s Excellent Adventure.”) Everywhere he goes, The Doctor saves planets and rights wrongs. He always has one or two traveling companions with him, and they’re usually from Earth. Over the years, several actors have played the character. 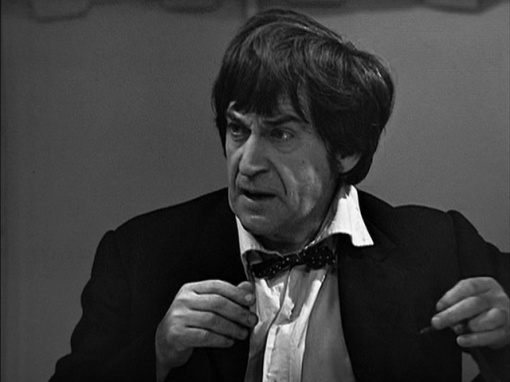 The second one, Patrick Troughton, is one of my favorites. This is a scene from an episode called “The Tomb of the Cybermen,” made in 1967. The Doctor is having a tender conversation with Victoria, played by Deborah Watling, who just began traveling with him in the previous episode. Victoria is dealing with the loss of her father. I’ve grown to love this community and appreciate its little quirks. And I’ve become so accustomed to it that I feel overwhelmed when I travel anywhere else. When I drive to Rome, my hometown, I feel like I’m in New York City. Over the past twelve years, I’ve learned to be very cautious of the small, locally-owned restaurants that spring up in Chattooga County. As soon as I get used to eating at them, they fold up and go out of business a week later … and I’m left feeling disappointed and betrayed. I don’t even bother patronizing those places anymore. Call me bitter if you want. For a while now, there’s been a buzz about a pizza place called The Crushed Tomato. I heard a lot of great things about it when it opened, so I made up my mind I would never eat there. I didn’t want to set myself up for another heartbreak. But the restaurant is still around and it seems to be thriving. So I reluctantly decided to check it out a couple of weeks ago. I’m glad I did. The pizza, first of all, is delicious. (And reasonably priced.) But the thing I like most is the atmosphere. It’s an old building. The walls are made of brick — with no paint — and there are vintage Coca-Cola signs hanging everywhere, along with some other interesting antiques. There’s something magical about it. The people who work there are very friendly too. I hope it stays in business for a long, long time. One of the characters in my book is supposed to have a dark complexion. That’s how I described her in the narrative. I did six illustrations for the book, beginning last summer and finishing up last month. Yes, that does seem like a long time for just six pictures. But I did them in colored pencil. (I also re-wrote the book twice during that period.) One illustration is a picture of this particular character, the one with the dark complexion, standing all by herself and smiling warmly at the viewer. Basically, it’s just a portait — a portrait of a fictional person. A couple of days ago, out of the blue, I realized that I didn’t make her skin dark enough. Or I suddenly thought I didn’t, anyway. I had drawn her with jet-black hair and dark eyes, but her skin wasn’t really very dark. I started feeling jittery and uncomfortable about the whole situation last night, the way I always do when I find a new thing to worry about. So I sat down on the couch and worked until about four o’clock in the morning, trying to make her skin a richer shade of brown. I should have left the stupid thing alone. Whenever I put a dark color on top of a light color, it never goes on smoothly. I know that. I don’t know what I was thinking. The dark color and the light color always mix together like oil and water. In other words, they don’t. Now the girl’s skin has a rough, grainy texture. Her face looks like it’s made of oatmeal. I went to sleep feeling angry, disappointed, and defeated. Luckily, I scanned the drawing a month ago when I first “finished” it. The earlier version is still in my computer, so I can use it like I was originally planning to. And it really doesn’t look that bad anyway. 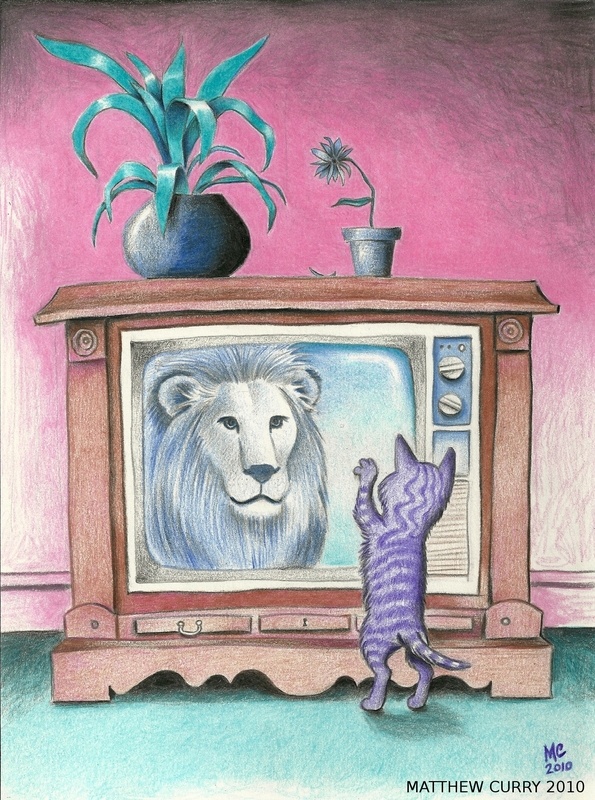 My good friend Trisha told me I’m just worrying too much because it’s almost time to upload the book to Kindle. I think she’s right. A little muscle under my left eye has been twitching all day long. I think I need some sleep.